New for Christmas 2015 …. 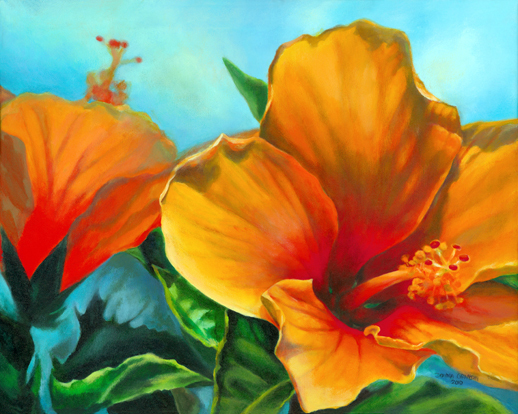 Donna Grandin Art Cards – Tropical series 1. 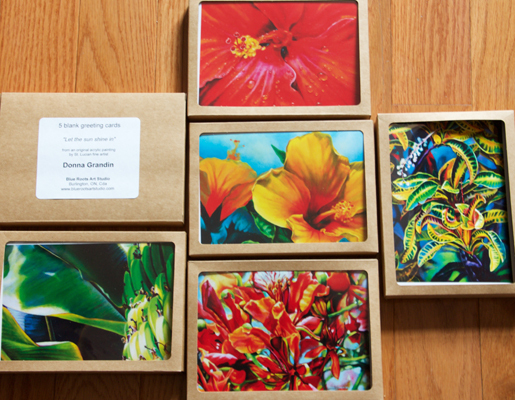 My blank greeting cards – packaged in sets of 5 in kraft boxes – available for local PICK-UP ONLY, Cdn $20. You can choose a mixed set, or have 5 of a single image (titles listed under images below). These are perfect for seasonal gift giving, or maybe just to keep for yourself! E-mail donna@bluerootsartstudio.com to reserve your boxes while supplies last. To have your order Shipped to you, refer to the instructions at the end of this post. In 2014 I had some blank 5″x7″ greeting cards made of 5 of my Original Acrylic Paintings for an event. I wanted fans of my art to be able to walk away from my exhibition with the feeling that they were taking a little piece of it home with them. 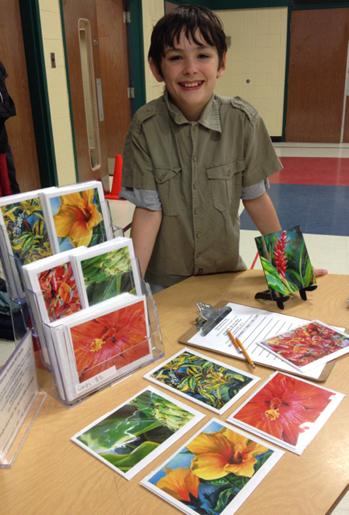 Then, I offered a percentage of card sales to my sons’ school as part of their recent fundraising BBQ. Art cards available at the BBQ, $5. each. I posted this photo on Facebook & a friend in New York ordered a set, then someone else from New York (maybe her friend) e-mailed me to order another set. After a few online orders, I also started sending them to St. Lucia, where they are sold through Island Mix, and a couple hotel boutiques. As an artist though, and not a big card company, I have only printed the cards in small batches. 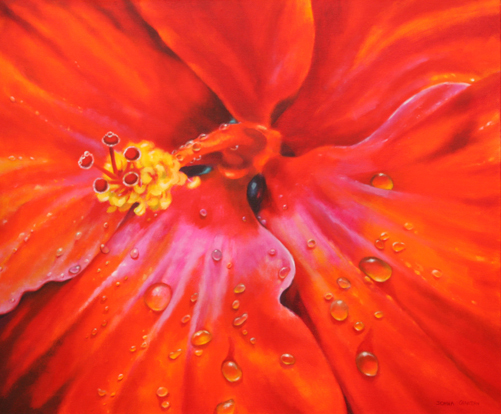 My main focus with them is to share my art with more people, and to gain exposure to potential collectors for my original paintings. 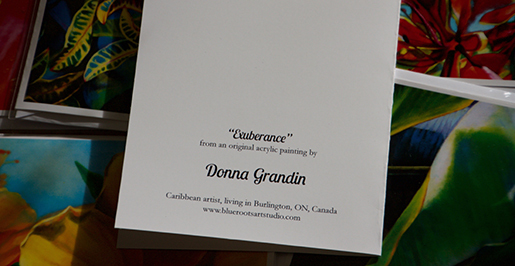 Give a set of Donna Grandin Art Cards to your kids’ teachers and coaches. They make great hostess, or thank you gifts. Use the cards for birthdays, thank you’s, get well’s, Mother’s or Father’s Day, or just because – it’s always good to have a few blank ones on hand for emergencies. Some people even like to put them in photo frames, and place them where they can brighten up their day, or tuck them into favourite books as inspiration! Do you want to partner with me for your Fundraiser (a percentage of card sales goes to your charity)? 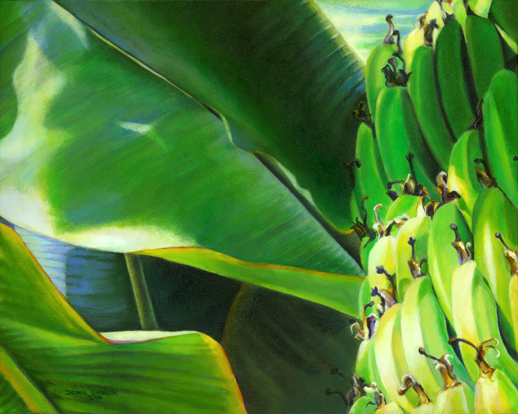 Or maybe you would like to become a Retailer for my art cards? If so, I’d love to hear from you! 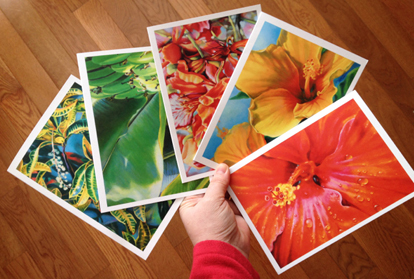 One set of 5 blank greeting cards with white envelopes (no box), including shipping & handling, is $23. to anywhere in Canada, $24. to US, and $27. International. Prices in Canadian dollars. E-mail to place an order, and I will reply with a Paypal invoice. 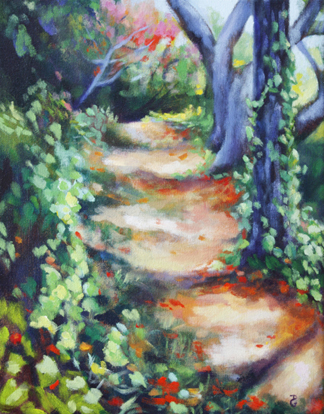 Flamboyant path, 14″x11″, acrylic on canvas, © 2014 Donna Grandin. $250. As promised, my first weekly “painting in a day”. 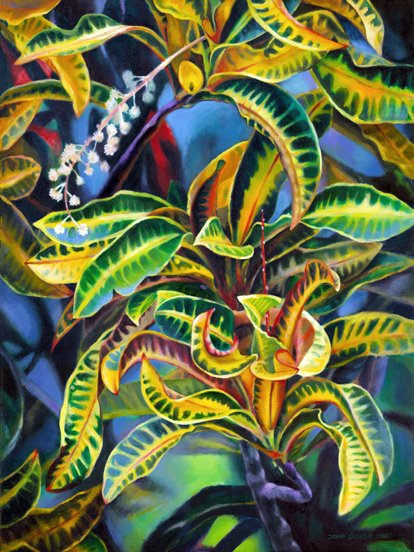 This one is based on a path at Pigeon Island National Park, in St. Lucia. Not far from the site I painted in “Nature Walk, during the 30 in 30 Challenge last month. 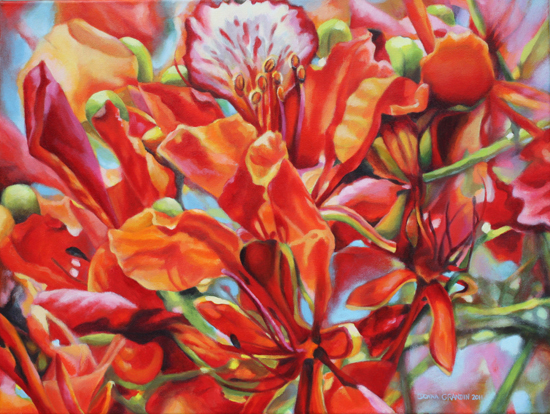 The flowers of the Flamboyant (Royal Poinciana) trees fall along the path, the red a temporary contrast to all the green. I’ve made it wider here though, it’s really just a simple trail, where the grass has been trampled down in time by people taking a shortcut up and down the slope. As is often the case with a path you’ve never taken before, only the next few steps are visible – you can’t see what awaits you at the top. It is an uphill climb, so it will take some effort, but with the right attitude, it could also be a lot of fun!